This is the moment one of Sri Lanka suicide bombers walked into a church just moments before detonating a device. 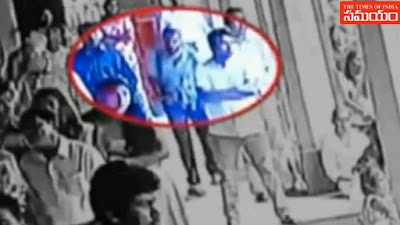 CCTV footage shows one of the attackers entering St Sebastian's Church -- a man wearing a large backpack walking into the building. A large queue of people can be seen waiting outside moments before the attack on Easter Sunday. In all, seven suicide bombers launched attacks on churches and five-star hotels, killing hundreds and injuring more than 500 people. Survivors of one of the church bombings have also described how a suicide bomber calmly walked past worshippers and even touched a child on the head moments before the blast. 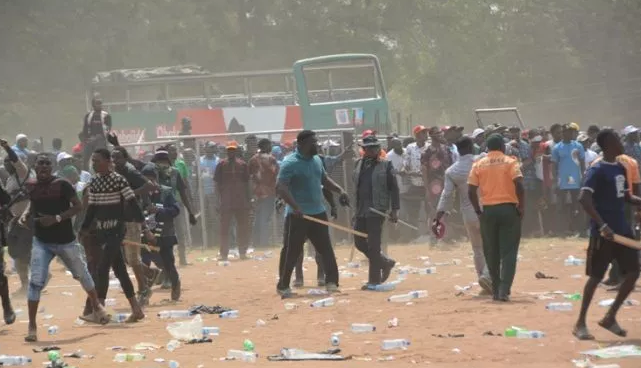 Hoodlums, suspected to be political thugs, on Sunday attacked Ogun State House of Assembly Deputy Speaker Kunle Oluomo. 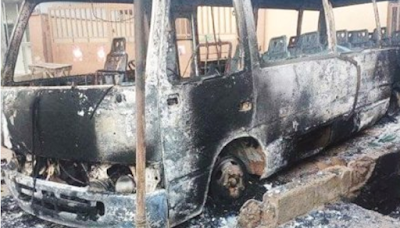 They torched his constituency office in Ifo and set ablaze five vehicles on the premises. The constituency office of the lawmaker representing Ifo/ Ewekoro Federal Constituency, Mr. Ibrahim Isiaka, was also burned down. At least two people were killed while several others injured in a clash between hoodlums early Monday in Coker Aguda area of Surulere, Lagos. Property worth several millions of naira, including cars were also destroyed during the violent clash that engulfed Adetola and Pako within the council area. Tragedy was averted after a speeding driver almost rammed into a residential building yesterday in Delta state. The driver who was allegedly drunk, was said to be on top speed before he lost control of the vehicle and crashed near the building. No casualties were recorded in the accident which left residents in shock. The Presidency disagreed on Monday that President Muhammadu Buhari was “sleeping on duty as the Commander-in-Chief,” a description the Catholic Bishop of Yola Diocese, Rt Rev Fr Stephen Mamza, gave of Buhari on Sunday. The cleric had, during an Easter homily he delivered in Yola, the Adamawa State capital, criticised the Buhari administration for allegedly failing to halt insecurity in the country, especially escalating kidanappings, banditry and other violent crimes. Speaking specifically on the latest killings in Zamfara, Benue, Adamawa, Taraba and Southern Kaduna, the bishop said, “We are really in a dilemma. We (Nigerians) are feeling that we don’t have protection. From all indications, there is nothing being done. There have been calls from all over the country. Look at what is happening in Zamfara State; look at what is happening in Benue periodically, in Nasarawa State and now in Adamawa (Southern Adamawa). 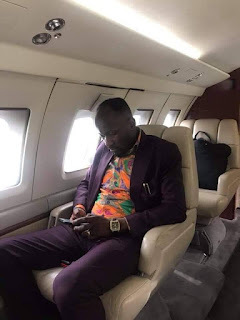 The General Overseer of Omega Fire Ministries International, Apostle Johnson Suleman, has acquired a private jet. Imo State Governor, Rochas Okorocha, has described a former governor of the state, Achike Udenwa, as the state’s worst governor ever. He said while another former governor of the state, Ikedi Ohakim, could still be remembered for his Clean and Green Initiatives, nothing could be said of Udenwa’s administration. Okorocha made the allegations in a statement made available to journalists in Owerri, the state capital, on Monday by his Chief Press Secretary, Sam Onwuemeodo. 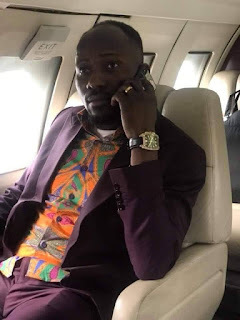 Onwuemeodo said the statement was the governor’s reaction to media attacks that Udenwa allegedly launched against Okorocha, Ohakim and President Muhammadu Buhari in the last four weeks. He claimed that the former governor was adjudged the worst in the history of the state. A chaotic moment was recorded as a young man and his girlfriend clashed yesterday in public in Delta state. It was gathered that the young man simply identified by his nickname ‘Shockey’, had a disagreement with his girlfriend and hence, decided to teach her a lesson by beating her in public in Sapele area. 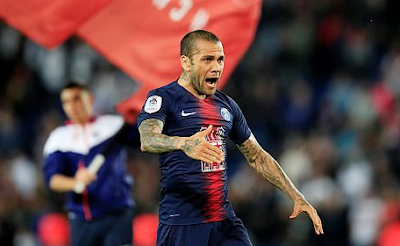 The Brazilian star became the most successful footballer in history as he claimed a remarkable 42nd career title on the weekend and he did it without even having to kick a ball. PSG's nearest challengers, Lille, were held to a stalemate with Toulouse, ensuring Thomas Tuchel's side claimed another title with six matches remaining still. A man terrified a woman he met online with death threats and vile jibes when she jilted him after they slept together, a court heard. The man identified as Victor Kruchinkin, 32, warned Christiana Amao that she was lucky to be alive after she ended their brief fling. The solicitor’s abusive Facebook messages also branded her a “gobby ethnic” and called her fat with “saggy t**s”. Kruchinkin lost his job after his arrest at his desk at Adams & Remers Solicitors in London’s Pall Mall.